At the beginning of this month I read Bernard Cornwell’s Fools and Mortals set in 1595 as the Lord Chamberlain’s Men are rehearsing Shakespeare’s new play, A Midsummer Night’s Dream. 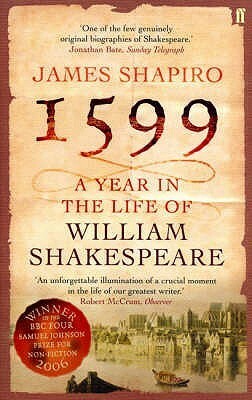 And I remembered another book that I’ve been meaning to read for over 10 years – 1599 A Year in the Life of William Shakespeare by James Shapiro. That was the year the Globe Theatre was built and that Shakespeare wrote Julius Caesar, Henry V, As You Like It and Hamlet. I’m not sure where this book actually begins – there is a Preface, then a Prologue before you get to Chapter 1 on page 27! So here are the opening lines of each. In 1599 Elizabethans sent off an army to crush an Irish rebellion, weathered an armada threat from Spain, gambled on a fledgling East India Company and waited to see who would succeed their ageing and childless Queen. They also flocked to London’s playhouses, including the newly built Globe. The weather in London in December 1598 had been frigid – so cold that ten days before New Year the Thames was nearly frozen over at London Bridge. It thawed just before Christmas, and hardy playgoers flocked to the outdoor Rose playhouse in Southwark in record numbers. But the weather turned freezing cold again on St John’s Day, the 27th, and a great snowstorm blanketed London on 28 December. As the snow fell, a dozen or so armed men gathered in Shoreditch, in London’s northern suburbs. The armed men then went to another playhouse, the nearby Theatre that had been vacant for two years and proceeded to dismantle the building. They took the frame to a waterfront warehouse near Bridewell Stairs to store it, ready to resurrect it as the Globe. Late in the afternoon of Tuesday 26 December 1598, two days before their fateful rendezvous at the Theatre, the Chamberlain’s men made their way through London’s dark and chilly streets to Whitehall Palace to perform for the Queen. Elizabeth had returned to Whitehall in mid-November in time for her Accession Day celebrations. Whitehall, her only London residence, was also her favourite palace and she spent a quarter of her reign there, especially around Christmas. The Chamberlain’s Men were at the Palace to play the first night of the Christmas holidays, performing The Second Part of Henry the Fourth. I think this is a book that will take me quite some time to read – it’s full of detail, not just about Shakespeare, his plays and the theatre, but also about the events of his life and times! I got this as a Christmas present a couple of years ago, and it has been on my TBR pile ever since. You have really made me want to read it now – the opening sounds like it would make a good winter read. I’ve heard great things about this book. Hope you love it. Sounds like a fascinating read. I’d stick with it. I’ve just been looking at my copy of this on the bookshelf while I did the ironing. Do go on with it. James Shapiro really does know what he’s talking about and also manages to write in a manner that gives everyone access to his ideas. I admire his work almost more than anyone else I’ve come across in the world of Shakespearian studies. He is also a really nice human being. I couldn’t say that for all of them. This does sound like a fascinating book. I agree that it won’t be an easy or quick read though. This week I am showcasing Heartstone by Elle Katherine White. Happy reading! This sounds fascinating. I’m glad you gave us all three. I’m super-intested now. This sounds fascinating and I did enjoy each of your three parts today – I thought the scene was set very well with the frozen Thames. I’m not sure about this one based on the intro – I’d read a bit more. I hope you are enjoying this one. I read his later one, The Year of Lear, about 1606, I think it was. Truthfully, I found it a bit of a mixed bag, some parts interesting, some less so. But I enjoyed it overall and seem to remember from comments at the time that people who’d read both thought this earlier one was the better of the two. Hope it grabs you! This does sound interesting, Margaret. Shakespeare is such a fascinating character, and, of course, a brilliant writer. I’d want to read on.